In the past eight months since my last post, I have relocated from the windy canyons of the financial district of San Francisco to the high plains of the northwest. The weather is dry, even in the late winter when the snow is over five feet deep. The sun shines for at least 200 hundred days out of the year and, on 1/5 of an acre, you can grow winter-hardy apples that fall from the fire-blighted tree by the bushel basketful. With all the upheaval of moving, little writing gets done. 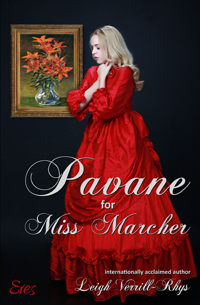 Besides a monthly contribution to the group blog, Classic and Cozy Books, updating my website with a new look and added features, the most I’ve completed has been revisions for a 2nd edition of Pavane for Miss Marcher, including consideration for a new cover image (which I have subsequently rejected—I like the “decadent red lilies”). But, for me, there is always gardening, my favorite displacement activity. Digging in the dirt—up here it is river bottom silt as nourishing as cotton wool and as malleable as cement—amounts to a good shovel and leverage—the key to all creative endeavor. Perseverance, persistence, planning, or in this case, planting. However, what I know abouthorticultural will fit on the first red line of an index card if you remember what those look like in this world of digital notation. Gardening for me is the real, down deep, nitty gritty of what Ralph Waldo Emerson praised as “work”. Being a New Englander as well, I appreciate the concept. And gardening is a great way to ensure that you meet your new neighbors. For the past month, my neighbors have watched me dig and toss, rake and rip at roots of Amur Honeysuckle. When they’re comfortable with my work ethic and horticultural efforts, they approach and say hello! Thank you, WikiHow! I’ll be moving on to Dance by the Light of the Moon now. Colette Ilar is not a gardener but she does dance. If you can name another of my novels in which the heroine is a dancer…you’ll win a copy of my next “Americans in Love” novel, which happens to be…Dance by the Light of the Moon! It’s good to be back. And thank you for reading my work. In loving memory of Dafydd Elwyn and my mother, Virginia Verge Verrill.